The Fathead Sunburst Anthias is like no other anthias. Unlike its streamlined relatives, it has a characteristic “fat” head and deep, teadrop shaped body and elegantly elongated pectoral fins. 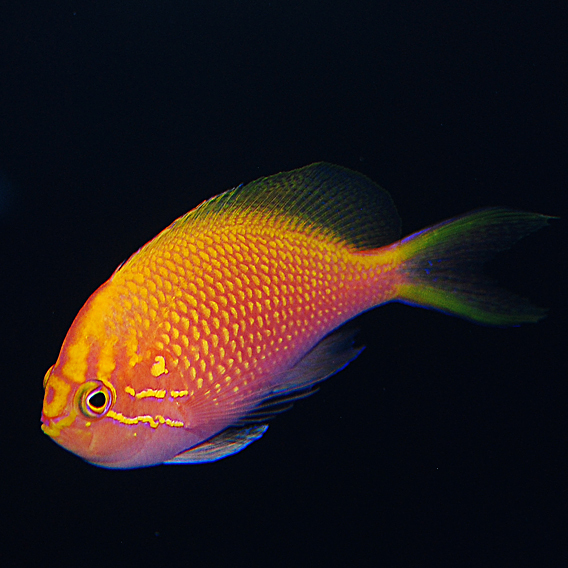 Instead of living in large harems like Pseudanthias, it is typically found singly or in pairs and less often in groups. This is a very shy, peaceful species that won’t harm corals or invertebrates. You may be tempted to force it to swim in the open by providing fewer hiding places, but that would have the opposite desired effect. Plenty of hiding places make this fish feel more confident and more likely to peek out from its cave. They may be difficult to feed when newly acclimated, but continue to offer a variety of meaty foods like mysis, copepods, live Artemia, and other zooplankton. Try to limit bright lighting, activity outside the aquarium, and avoid all but the most peaceful tankmates while conditioning the fathead sunburst anthias. This species does fine when housed singly, but you may keep a pair or trio in a larger aquarium. Keep only one male per tank. Like other anthias, this species begins life as female. Larger specimens are usually male, so don’t try to house to large specimens together.